Berlin. 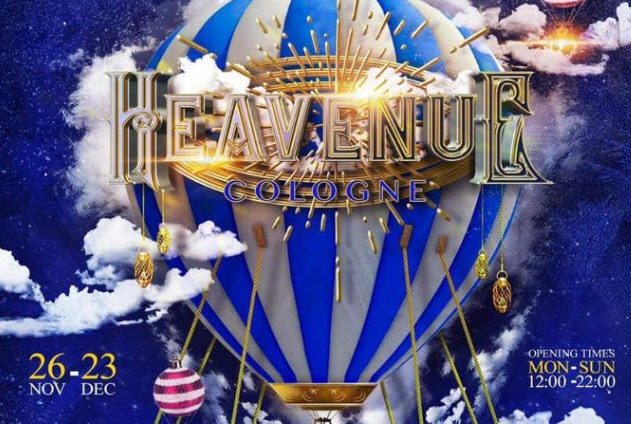 HEAVENUE COLOGNE will be the new the gay christmas market from 26.11. to 23.12.2018 at the Schaafenstrasse Cologne . It will be heavenly this year on the grounds of the Sparkasse KölnBonn near Rudolfplatz. The local gay Christmas market returns this year in a completely new guise: new organizer, new name, new concept. The mile between Hahnen- and Schaafenstrasse shines in the future as HEAVENUE-a word creation from "Heaven" and "Avenue"-in a completely new light. Whoever walks through the heavenly entrance portal enters the Christmas sky on earth! The concept of the former Christmas Avenue is finished with the last edition in 2017.